I am such a fan of nail art. Whether it be done in a salon, at home or using nail stickers. Jamberry is an 'all over' nail wrap that can easily be applied from the comfort of your home. 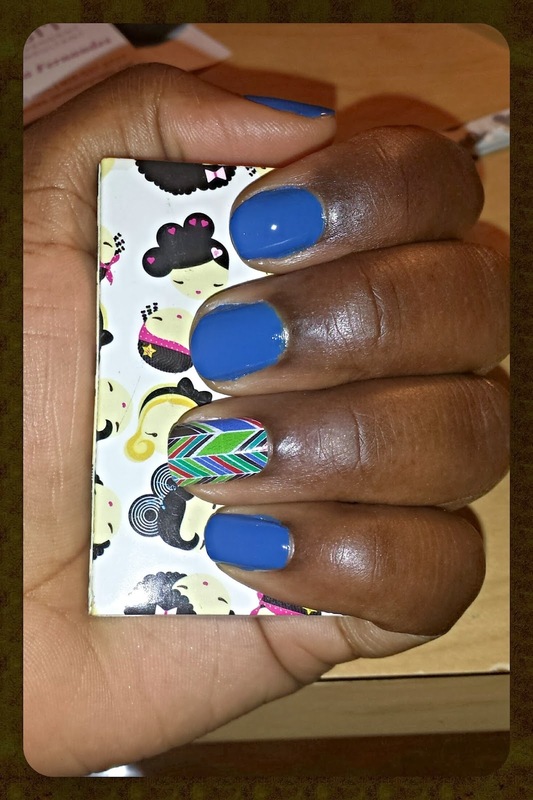 With 6 simple steps to apply, this vinyl nail wrap is not made of nail polish. The wear longevity of this product is said to be 2 weeks for nails and approximately 4 weeks for the toes. With the likelihood of no chipping. This is great for the woman on-the-go, who always wants that manicured look. As I set up the required tools for application which included a nail file, cotton pad + alcohol (or alcohol wipes) and a hair dryer; I thought to myself this would be tedious. I soon found, out I was wrong. It was a quick easy process with no trimming of the product required (fit my nail bed perfectly). When it came to trimming the ends off, to fit the length of your nails I found this part a little tricky. Due to the material of the wraps, it was a bit difficult to get the wrap to lay smoothly on the tip of the 'free edge' on the nail (eventually I got it to work-by warming the wrap while it was on my nail and adding more pressure). However everywhere else the wrap applied and laid smoothly with no appearance of lifting. - Ensure there are no oils or residue on your nails for the best application. - Use your blow-dryer on the highest heat to warm up the wraps properly (heat needed to activate the adhesive). - When holding the wraps during this step, I held it with tweezers because I found the air too hot to hold it with my bare hands. Love the product. You can get intricate designs done quickly (they offer lots of patterns from simple to intricate in many colours). I have worn this wrap for over 3 days and so far I really do like it (and I am amazed it is still on since I use my hands a lot). They always have amazing deals on these nail wraps (so contact your closest Jamberry Nail representative). Plus Christmas is right around the corner and this is a great stocking stuffer! Have you used Jamberry Nails? A two week final review will be done. *Disclosure: This is a sponsored review from a Jamberry Nail Consultant. The product was not bought, but given for my honest review. Therefore all opinions are my own. 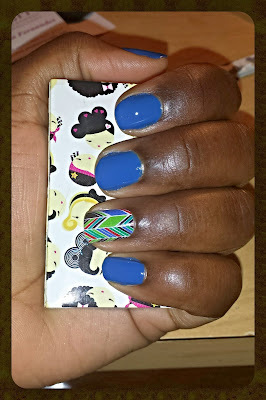 I love that blue with the chevron like accent nail design! I was really into different shades of blue over the summer but now that it is freezing in Toronto I have taken to more Christmas themed colors. Surprisingly I find myself in love with blue this season, but definitely still using the oxblood, burngundy, red and plum tones to go along with the Xmas trends.